USDJPY remains in the downtrend from 111.90, the bounce from 109.70 is likely consolidation for the downtrend. Range trading between 109.70 and 110.60 would likely be seen in a couple of days. As long as 110.60 resistance holds, the downside movement could be expected to continue and next target would be at 109.00 area. 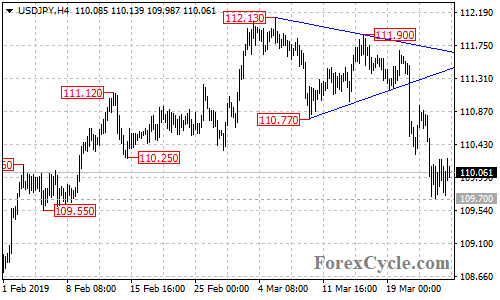 Only break above 110.60 resistance could signal completion of the downtrend.